I want to preface this with another tangent about how I feel like I’ve found common ground with the Finnish – these are a people that value picking and eating raw foods in the woods. Finns have a legislated right to harvest from the bosom of Mother Nature almost anywhere they want – it’s called ‘Everyman’s Right’, and entitles people to gather and catch (fish caught with a rod and line are included) what they will, no matter who owns the land, and even if the intent is sale. 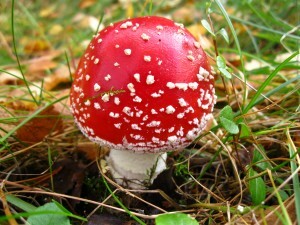 As a result, Finns are aficionados of wild berries, mushrooms, herbs, and other yummy stuff that you can hunt and gather. I’m a girl who likes life. I grew up with a healthy respect for poisons and allergies, as I seem to have my fair share of run-ins with both. 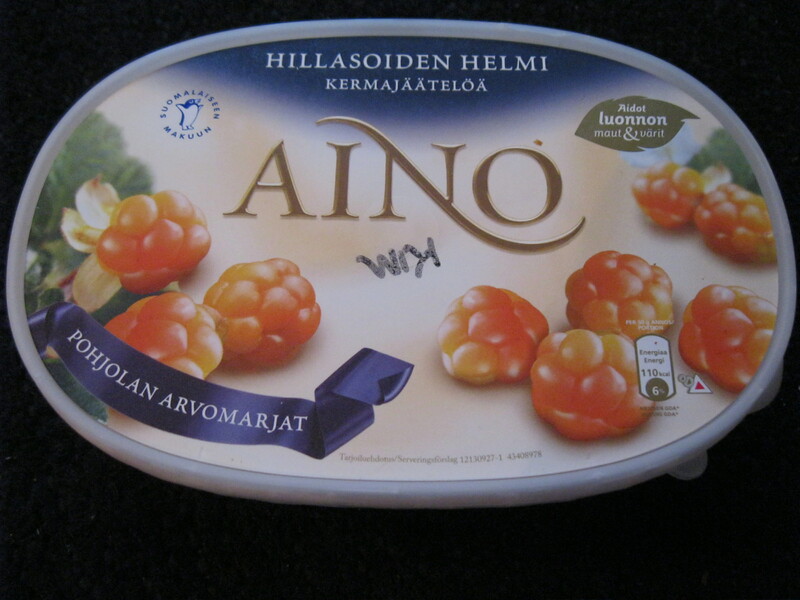 One of the strongest memories of my childhood is learning about the ‘no-no berry’. 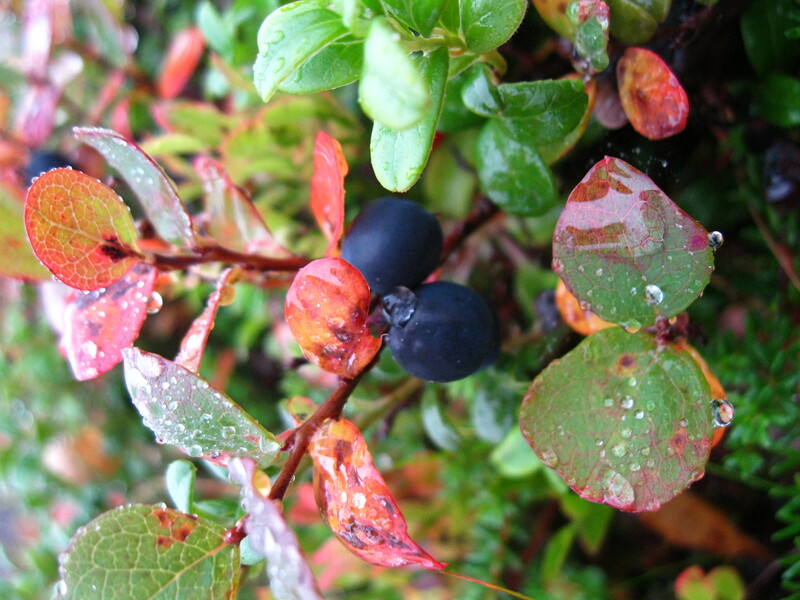 The ‘no-no berry’ is not a specific berry, but rather the entire class of small, colorful, botanical fruits that will cause one harm. My mother instilled a bone-deep respect for the ‘no-no berry’ in me at a young age. I think perhaps the poison control operators in Fort Worth may have sent her a muffin basket after I finally retained her ‘no-no berry’ wisdom. :) The ‘no-no berry’ wisdom boils down to this: if you haven’t ever seen it on your mother-prepared cereal or pancakes, DON’T EAT IT! This is especially true of anything red-colored. Red = dangerous. In its most reduced form, the idea that you don’t put anything you harvest in your mouth that you haven’t already survived eating is a pretty good one. I’m a fan. 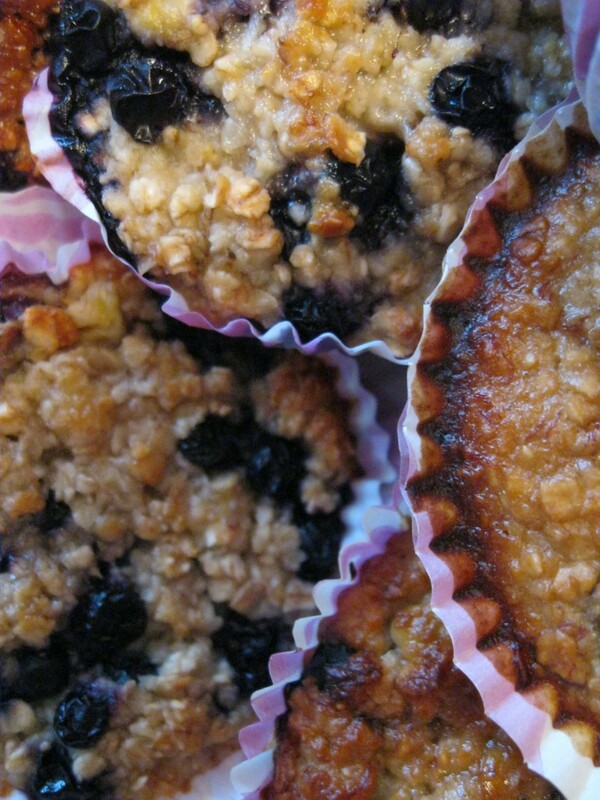 Over the years, I’ve continued to use the phrase ‘no-no berry’, much to Brandon’s chagrin. It’s made a major reappearance in my internal dialogue since moving here, since there’s a lot of stuff of a tempingly edible-looking nature in the woods. I refrained from ingesting any of it before seeking the counsel of Finns, which is why meeting Heini borders on the providential. I have now been given the green light on eating anything I can find (not including mushrooms), save one exception, explained further below. So here’s an intro to all the yummy things that I have subsequently been gobbling! 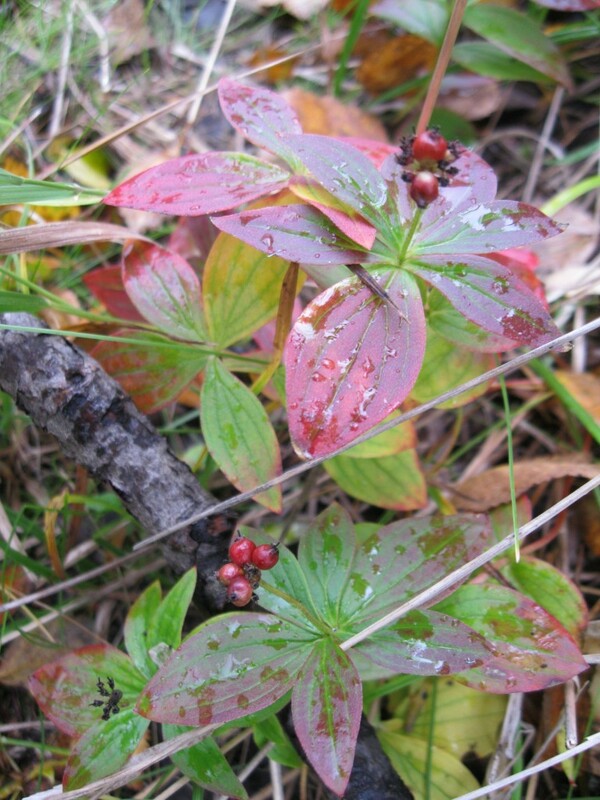 Puffy and proud, these little yellow to red gems are an Arctic specialty. 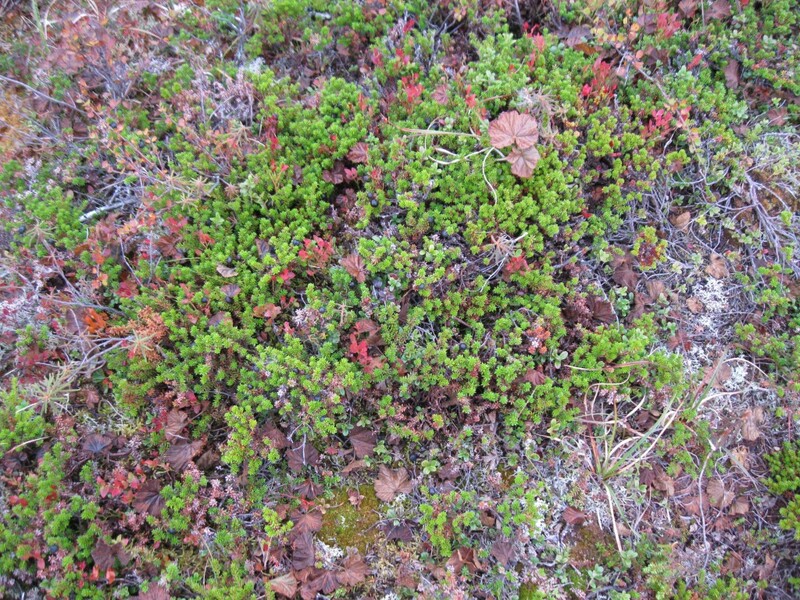 I found them in both Kevo and Kilpisjärvi, both in wetter, acidic soils. 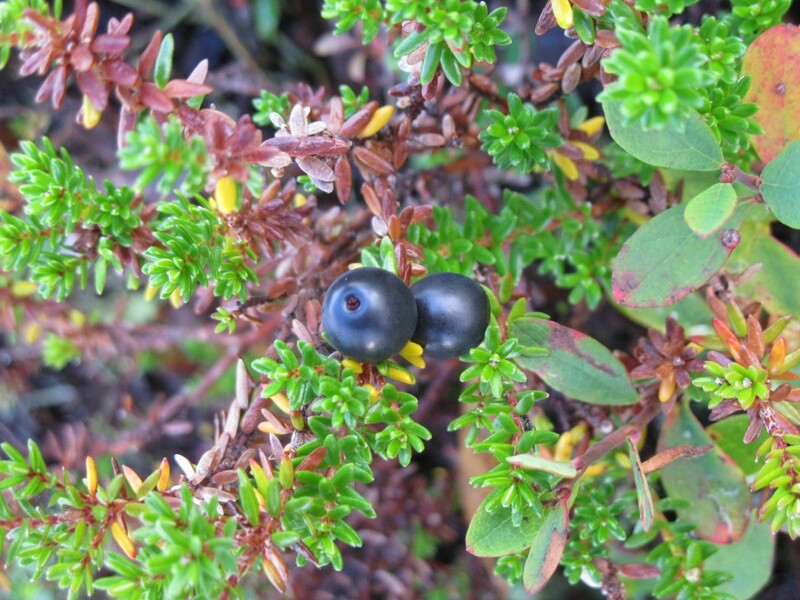 They look a lot like a blackberry in form and size, but are shot forth from the tundra soils on single stalks that only extend an inch or so from the ground (hence the ‘proud’ moniker, because they look so defiant in their tiny, solitary thrusts). 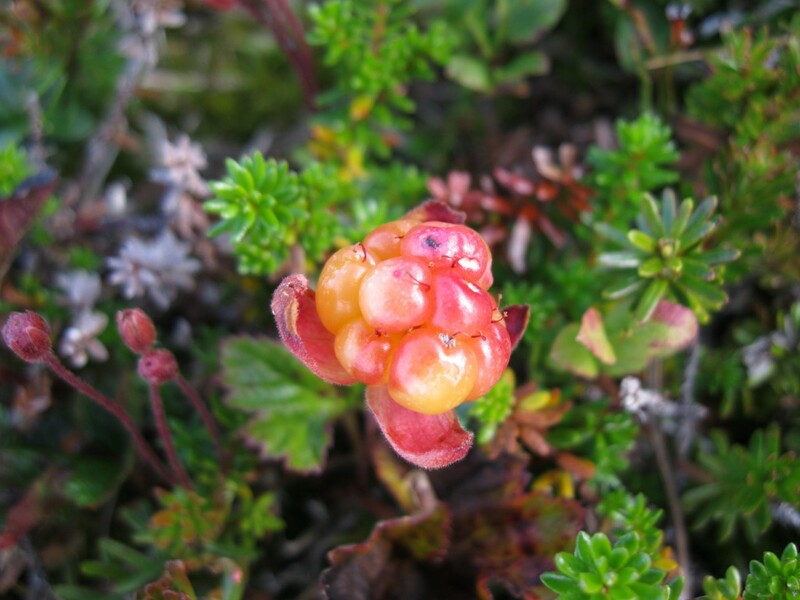 I got here a little late in the cloudberry season, so the ones that I found and snacked on were a little past their prime, evident in their raisin-wrinkly skins and gooey-rather-than-bursting juices. They pack a punch of vitamin C, though. Heini says you get the same amount of vitamin C as you’d get from a whole orange in only 2-3 of these raspberry-sized powerhouses! I found cloudberry ice cream at the grocery store in Utsjoki and snagged it up. The tart, creamy taste of the berries is a really good complement to the vanilla base, and I see why it’s so common to pair cloudberries with both vanilla and dairy. Cloudberry jam is also a Finnish staple, and has graced every breakfast buffet I’ve seen here, although I thought it was marmalade for the first few weeks until I asked. 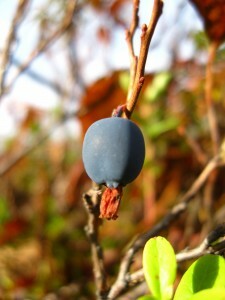 I feel somewhat protective of this berry, for it lacks the prestige of all the others, but has a lot going for it. They’re the most difficult to gather, as they do a pretty good job of hiding in very dense underbrush, and the vegetative parts of this plant are extremely fragile and sensitive to touch and trampling. You have to do a lot of leaning, and I tend to leave reverse tonsure-esque clusters of berries when harvesting from patches I can’t reach the middle of. 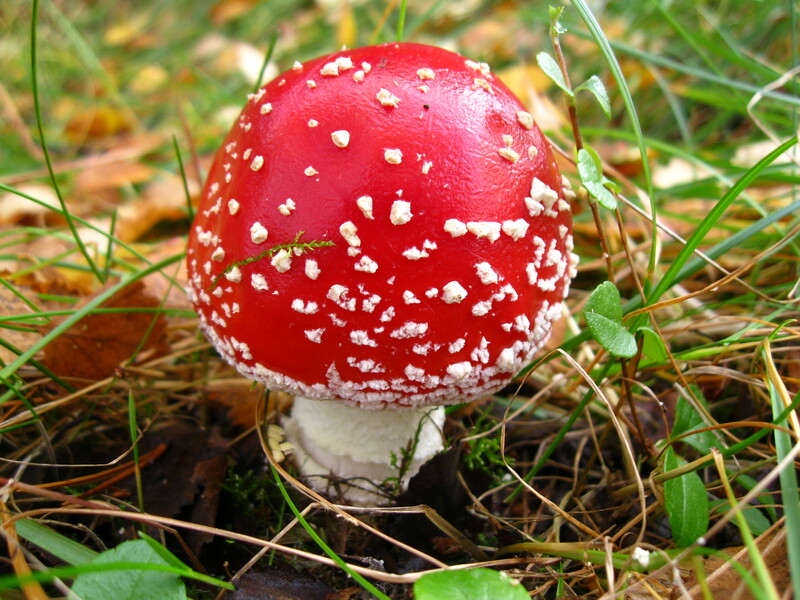 There’s also no hope of recovery if you snag them off their plant and subsequently drop them, as this plant is too thick and sort of floats in a mat of itself above the soil. It’s a black hole for dropped berries. I can only assume that this is how it propagates, because they’re slippery little suckers! That said, they are also ubiquitous and ridiculously bountiful, so they make up for the hassle of gathering by ease of access and quantity. They taste a lot like pomegranate seeds to me, mostly due to their burst-like texture of slightly watery, red-colored juice. The flavor is less pronounced than any of the other berries, but they contain all the fiber and antioxidants and other healthy stuff, and the refreshing gusher-like experience gets a little addictive. 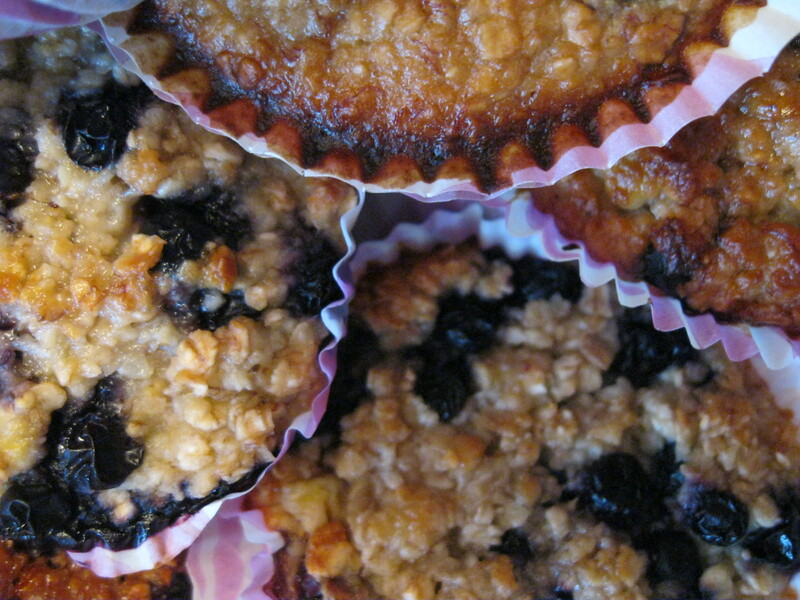 I replaced blueberries with crowberries in a batch of banana oat berry muffins I made last night, and they have a great baking quality – they don’t disintegrate in your batter, but they burst when baked. Perfect. 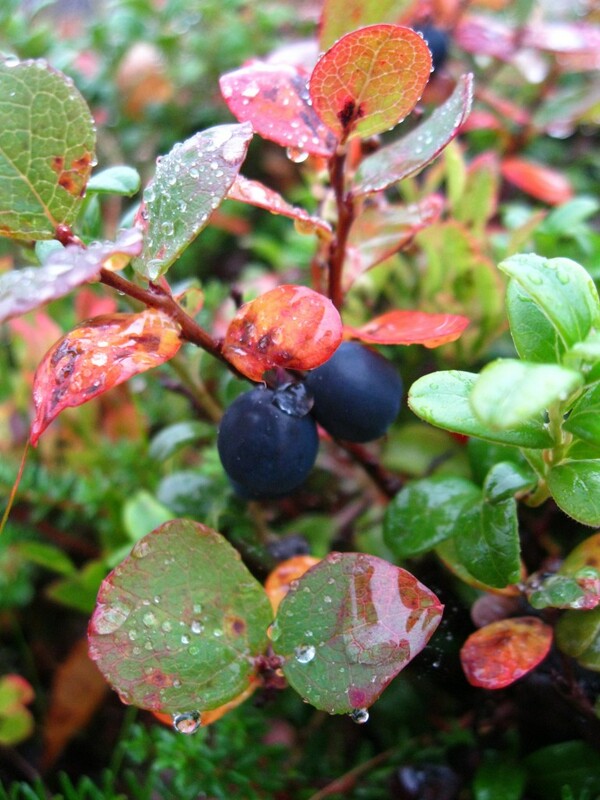 In Lapland, the blueberry’s first cousin is the ‘bog blueberry’, which is a slightly elongated version of ol’ blue that boasts clear guts, a slightly smoother texture, and a bit more of an acidic kick at the finish. 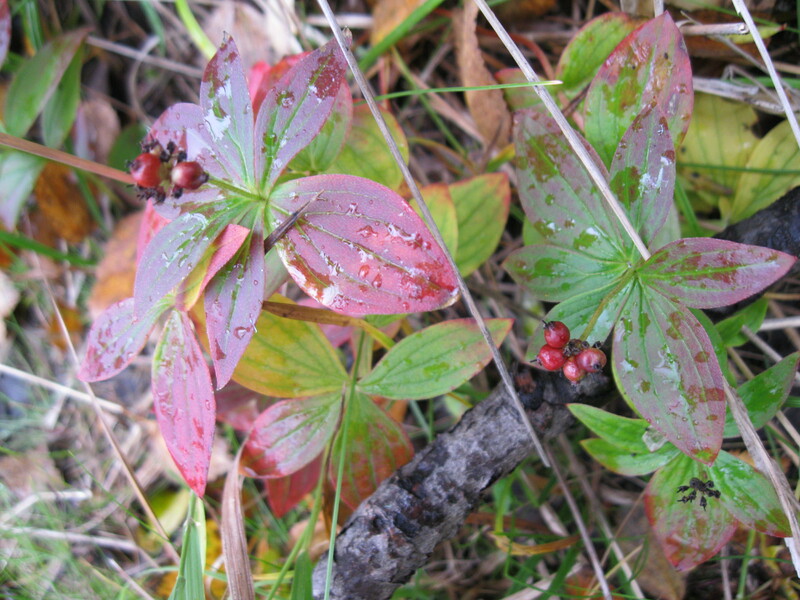 And if you can’t tell from the berry itself, the bog blueberry plant has leaves that are more rounded on the ends (see directly above), as opposed to the pointed, more oval leaves on blueberry plants (refer to blueberry picture). They also seem to hold on to their flower petals pretty well, as there are often dried petals still attached to the berry ends. 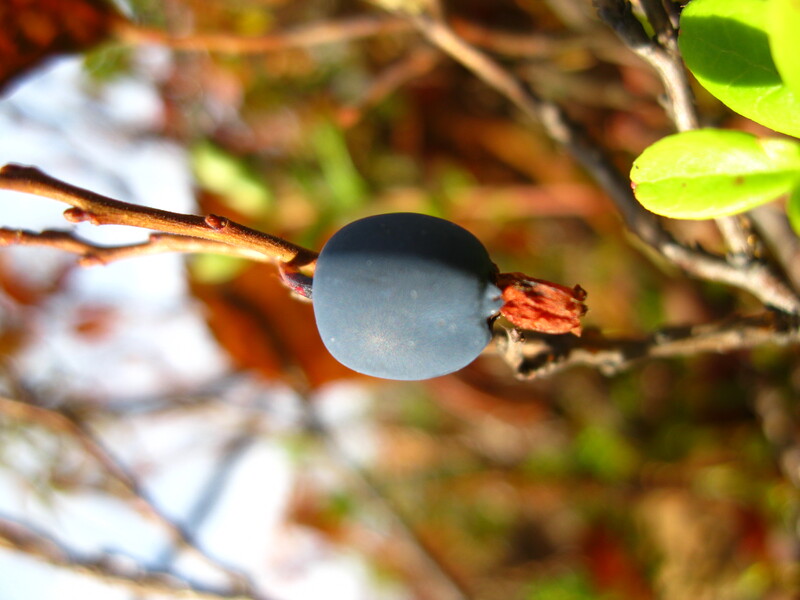 Because I’m late in the season, the specimens I’ve been eating of both blue-tinted berry varieties are a bit more sour than commercial blueberries, but pretty thick on the ground, so I’m not complaining. Yum. 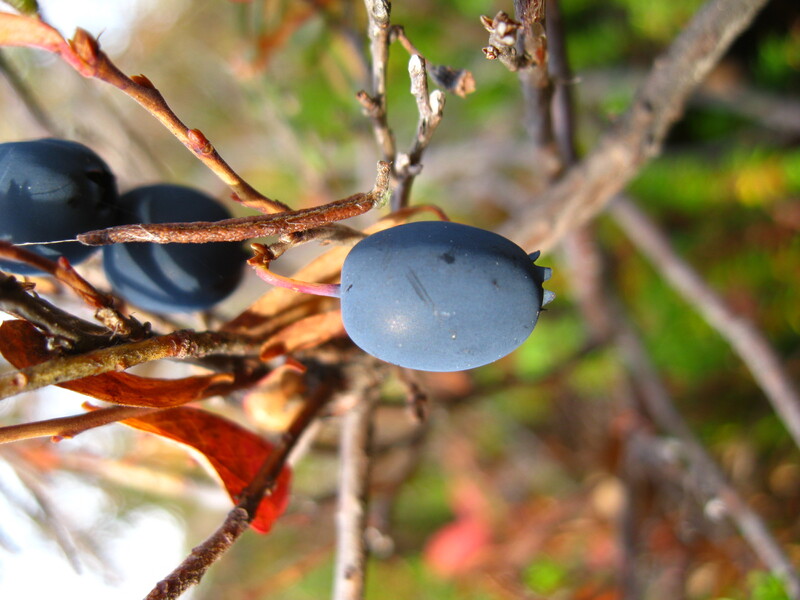 These berries are found in grape-like clusters of small, hard, bright red fruits. You can grab at the top of the cluster and sort wiggle down the stem, knocking off your prey in larger quantities with minimal effort. 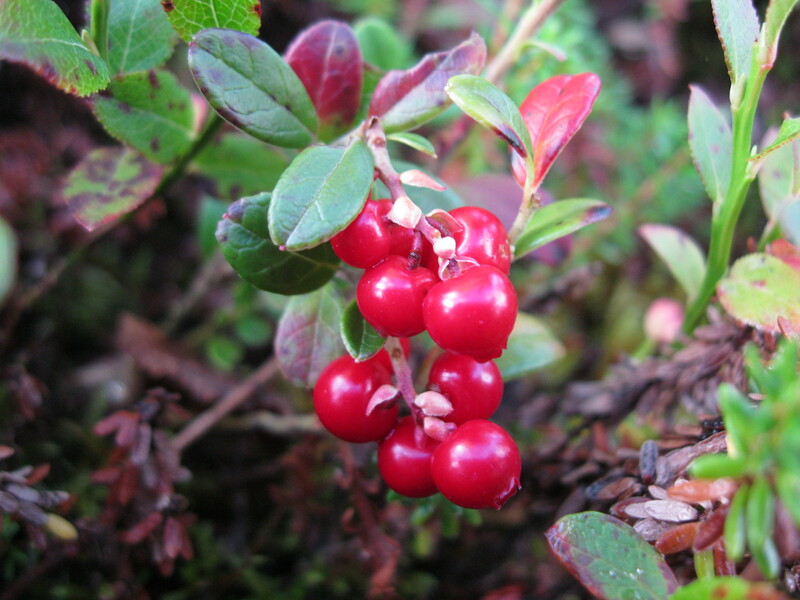 These puppies pack a wallop of proanthocyanidins (the same stuff that you find in cranberries that helps urinary health) and have the same, slightly astringent flavor of their boggy brethren. Finns are big fans of a soupy jam made from lingonberries, and pair it with everything from cake to cheese to meatballs (Finns use lingonberry jam like Midwesterners and their grape jelly meatballs – you heard me, Peggy!). 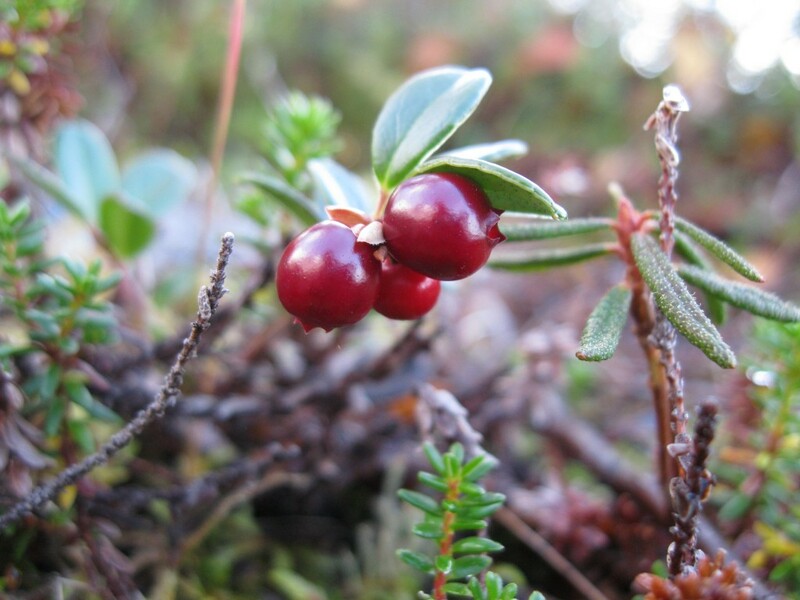 Lingonberries are the only berry here that I’ve been hesitant to harvest – it’s that ingrained ‘no-no berry’ red = danger thing…. I’ve subsequently gotten over my reticence and have gathered enough of these to make the traditional jam for myself! 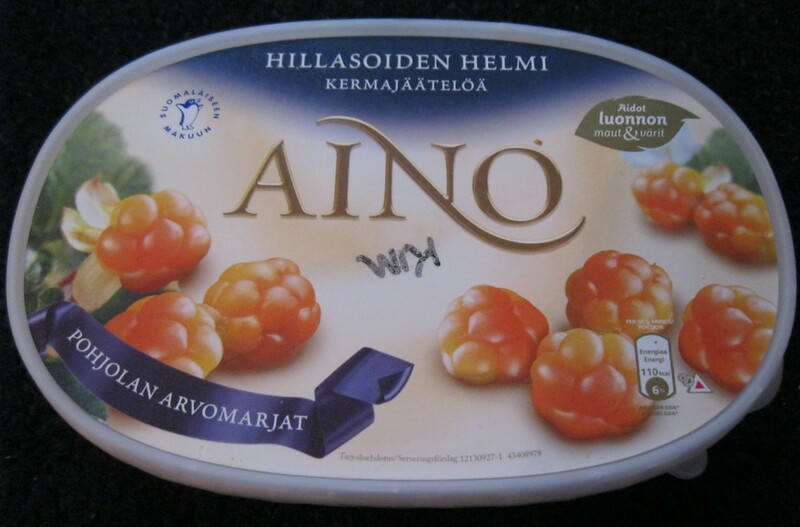 According to Heini, there is only one actual ‘no-no berry’ here in Lapland, which is a small red berry (vindicated!) 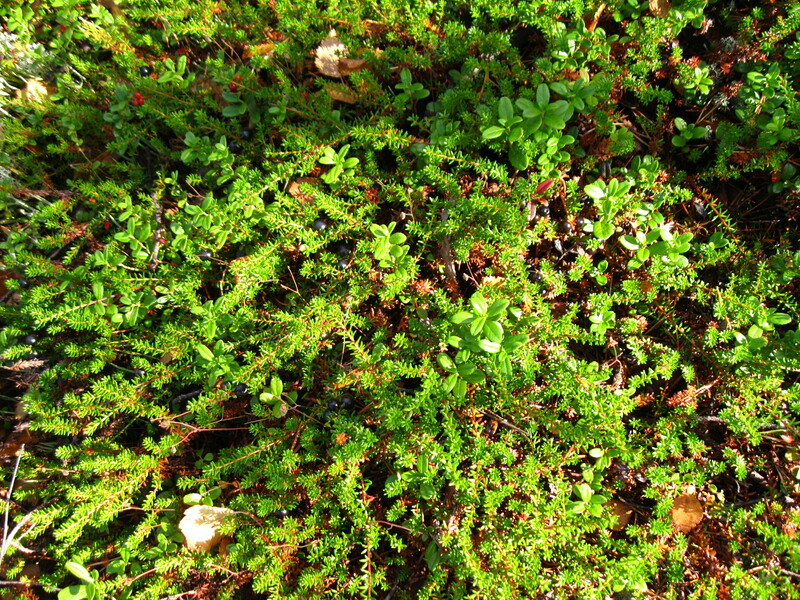 called ruohokanukka marja (in Finnish it means something like ‘weed berry’), but the plant is very different from the lingonberry’s foliage, so it’s easy to distinguish (as you can see in the picture below). Heini also assures me that this ‘no-no berry’ will cause only a slight stomach upset, but not do me any real harm if ingested accidentally. Whew. I’ve also been ruminating about my harvesting predilections – is my inability to walk away while there are still easily visible and reachable berries to be had an American thing? A Kim thing? Is this my mortal sin of gluttony rearing its head? I have to constantly tell myself to leave some berries on the plant and walk away to the next one. That’s the messed up part – there’s always another patch within eyesight. So why do I compulsively strip them to their stalks? I combat my natural greediness by being more conscientious about which berries I pick – if I concentrate on only picking the perfectly ripe berries, I inevitably leave some there. Despite this, I have a certain amount of guilt associated with my tendency towards berry-associated voracity, so perhaps I was doing more than just doodling pictures in the bibles during mass all those years as a child…. Due to my dedication to making up for those lost 2 weeks before I knew I could eat it all (muwhahaha! 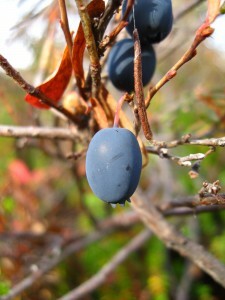 ), I have been doing a lot of berry picking here at Kevo. I’ve also found that picking berries in the wild is a lot like those 3D magic eye pictures, where you have to train your eyes to focus on different levels before you can see the hidden image. I have equipped myself with focus filters for each of the berry varieties. This is especially needed for the crowberries, which are masters at stealth. 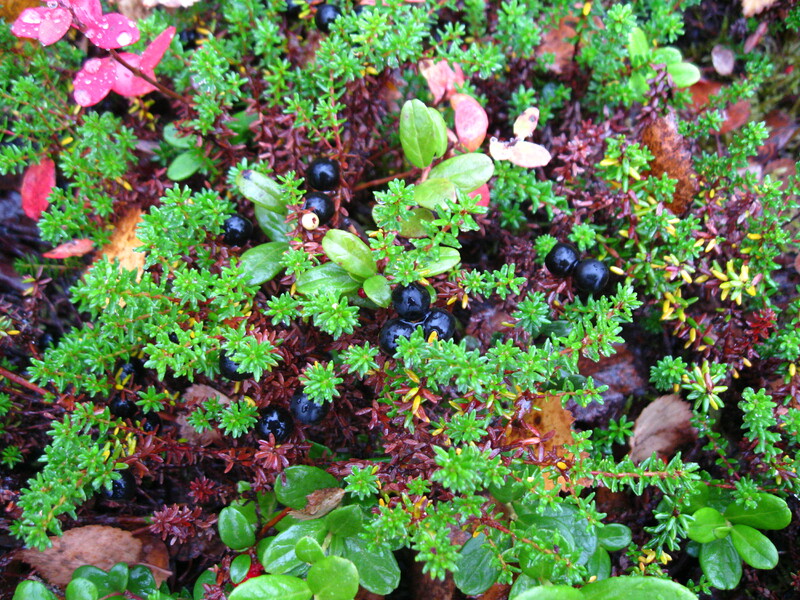 Example: can you see that this is a virtual schmorgasboard of crowberries? 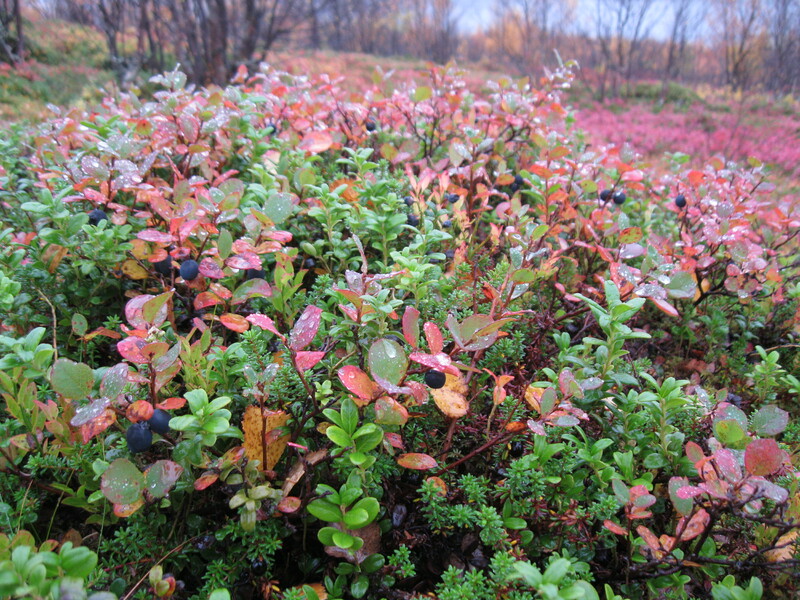 The night frosts are starting in earnest here in Lapland, so the 2012 berry season is coming to a close, but let this serve as an open invitation to all y’all to come for a visit and pick berries with me next summer. I promise that it’s worth it. You are a girl after my own heart! All I got in my field work this summer were a few red huckleberries, and one bush full of black raspberries. Thank goodness for the blackberries along Putah Creek! Do you remember picking berries up the hill by the cottage? Probably blackberries. 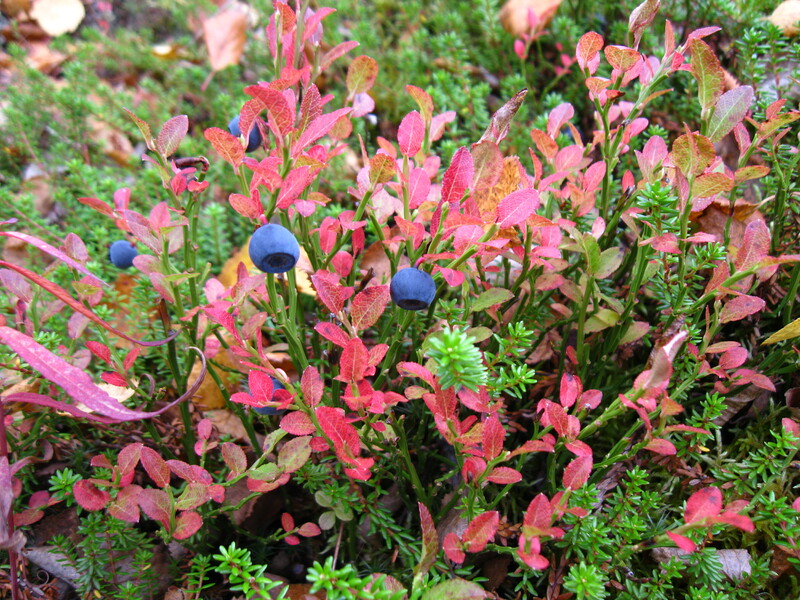 Crowberries and Bilberries.I like their names. And your blog makes it clear that a condensed arctic summer encourages making the most of and valuing to the highest all you can be. The biggest, greediest, most voracious mosquito you can be, the highest vitamin C cloudberry you can manage, the most proanthocyanid rich lingonberry you can imagine. Mmmmmm. Kim I’m loving reading these! and wow, am impressed with the visuals as well– are you getting the images from the web, or are these your pictures? Thanks for keeping up on your adventures… how thrilling that you got to see Northern Lights and eat all those arctic berries. Too fun. Am missing you!